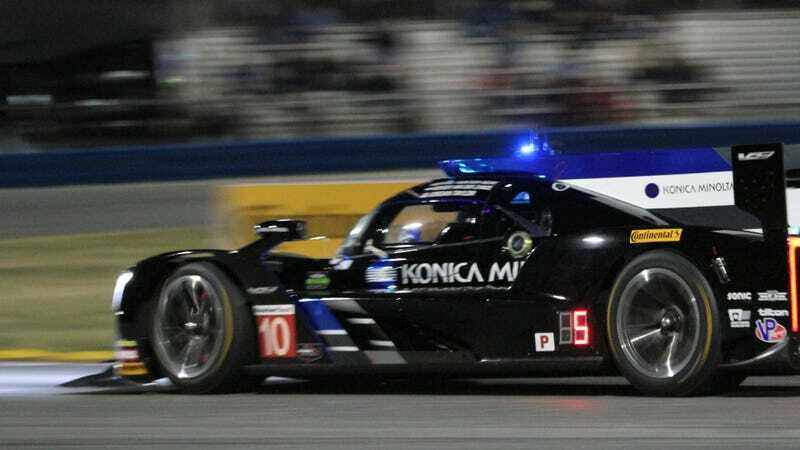 With around six and a half hours left in this year’s 24 Hours of Daytona race, 2017 24 Hours of Daytona winners Wayne Taylor Racing already threw in the towel, citing safety concerns with their Prototype class-spec Continental tires. Tire failures have dogged an otherwise fairly standard Rolex 24, with many happening on the right rear corners of the series’ fastest Prototype cars. It is absolutely unheard of for the Wayne Taylor Racing guys to give up on a race without an extremely good reason, so the fact that they’re out early over tires from this race is a really bad sign. They won pole position in qualifying for the race and had a serious shot to repeat last year’s win. I can’t put into words how disappointing this has been for our partners, the team, the drivers. We had a tire failure with Jordan in the car once, we went to Continental and we were within the tire pressures. We continued on and Renger had six or seven catastrophic failures, we have gone through so many parts on the car, that now because nobody can tell us what is happening, I can’t afford to put a driver at risk. Both the Prototype and GTD class run Continental tires in the WeatherTech Sportscar Championship, of which the Rolex 24 is a part. Continental’s response to the tire failures was to see if teams were running the tires outside of their recommended specifications—things like tire pressures and camber settings—but Taylor says their car was well within the specs before they opted to retire it. Yet it hasn’t only been a Cadillac problem, or even limited to the IMSA-only DPi cars. Even the international-spec LMP2s of Jackie Chan DC Racing and United Autosports had tires go down. The right rears on these cars see a considerable amount of stress around Daytona’s high banking due to the direction they run, so understandably, they have been the ones that fail the most often. Elsewhere in the race, the Ford GT continues to walk away from the field in the GTLM class, with both of its cars a full lap ahead of the third-place Corvette at the time of this writing. Of the new cars for this year, the Team Penske Acura was the most promising, qualifying second for the race but both their cars fell behind later thanks to unfortunate trips to the garage for repairs—the No. 6 for a new alternator, and the No. 7 for repairs after contact with the No. 31 Cadillac DPi-V.R. Acura’s No. 7 and No. 6 sit ninth and tenth at the moment, respectively. BMW Team RLL’s M8 GTE looks fantastic, but the team has complained about the low power spec the series mandated their car run this weekend in an effort to balance out its performance with the other cars in the GTLM class. Elsewhere, Mazda is having a disappointingly typical race with their RT24-P prototypes despite the new partnership with endurance racing powerhouse Team Joest. The No. 55 had to retire after catching fire on track, and the No. 77 has lost time back in the garage as well. Fernando Alonso’s infamously lousy luck struck the No. 23 United Autosports car, which had a brake master cylinder have to be replaced mid-race in addition to the tire woes. GTD is our best hope for a good, clean, close fight for the lead, even though a few of their cars have also had tire issues. The No. 11 GRT Grasser Racing Team Lamborghini Huracán GT3 currently sits in the lead, only 12 seconds ahead of the next car. Quick GTD contender Montaplast by Land Motorsport’s No. 29 Audi R8 LMS GT3 received an unusual stop and five-minute hold penalty mid-race for fueling faster than allowed thanks to a shortened fuel hose. With 21 cars in the GTD class, folks are looking for any advantage they can get, legal or not. CORRECTION [11:28 a.m. ET]: This post was written with three hours and forty minutes left in the race, but the Wayne Taylor Racing No. 10 was out earlier that that. This has been amended above. UPDATE [12:15 p.m.]: Continental tweeted earlier in the night that the tires use the same compound they’ve run for the past five years, so they should be a known quantity. However, while they initially speculated that teams were pushing the limits of these tires, they noted that the Wayne Taylor Racing team was operating within the specs of their tires. Continental also said that they will continue to investigate three of the tire failures that were not identified as punctures. Maybe it’s time to update the tires to handle the increased loads of downforce produced by IMSA’s current Prototype-class cars after all? CORRECTION [1/31/18]: An earlier stat given to Jalopnik by a Cadillac spokesperson that the other Cadillac prototypes had “around three tire failures each” was not correct, per a Continental representative. This has been taken out above to reflect that. The No. 5 Cadillac, which went on to win the Rolex 24 overall, had no tire failures during the race, and the No. 31 only had one, albeit while on a triple stint and after the tire sustained a cut in the sidewall, which was deemed likely from debris.